Life is busy. Crazily so. And us writers tend to want to find time to write, but never manage to because time is just so hard to find. If you attend school, your teachers are giving you tons of work, your friends are giving you tons of drama, and location is giving you tons of travelling. If you're an adult and are out of school, then you've got work, friends, family, and scary adult stuff that's drinking up your time like that thirsty writing dragon that comes along and slurps your chai when you're not looking. So how can you find enough time to write? It's definitely something that I've been struggling with over the past year. Teachers are loading me up with school work, friends are throwing drama at me, and life in general seems to have very little concept of the fact that it takes time to write words. Don't get me wrong, I love school, friends, family and life in general, it just does make it quite challenging to manage to write among all of that. So I figured I'd give you a few ideas and tips that have been helping me out lately. 1. You can write small amounts. This is one of the things that took me a while to work out. I'm used to being able to sit down and churn out over 1000 words in a day, but when you need to churn out two essays in a day as well, it just can't happen. As it is, I find that it is helpful to remember that even if you just write a few hundred words in ten or so minutes, that is still writing, and it is still getting you somewhere. If you have a teacher who is late for class, you can just write a few more lines and enjoy that bit of freedom to write. Sure, it doesn't produce much when you do this, but it helps you feel more like you're getting a chance to write. 2. Make the things stopping you from writing, start you writing. 3. Write on the way. 4. Get the other things done ASAP. I'm horrible at following this one, but I'll say it any way. If you've been given an assignment that isn't due for another three weeks, don't leave it until the last minute. Get it done early. Otherwise, you'll spend the entire last week stressing over it, and won't actually get it done until the night before, but will have spent the entire week leading up to it procrastinating furiously, all the while being freaked out cos there is no way you can finish this thing on time. Basically, if you finish it early, then you can say bye-bye to stress, and sit down and write when you would have been freaking out over a project. 5. If none of these are working, wake up half an hour earlier. Unless you are so frantically busy that you aren't even getting enough sleep, waking up a bit earlier to get some writing in at the start of the day is a good option. I have a tendency to wake up a bit earlier some mornings if I really want to get some writing done, and it actually doesn't work too badly. Don't wake up an extra two hours before you normally would, but a little bit doesn't hurt. I hope that helps you guys out for being able to write! 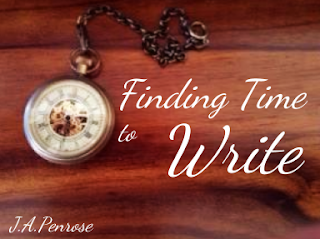 Have you got any ideas on how to make time to write? Ever used any of these ones? I don't really have this problem too often, thankfully, but it's definitely hard to balance things sometimes. Getting up early is also WAY better than going to bed later. Indeed it is. Indeed it is. Yay! Glad to help! And noooo, you are not alone. I'd say a fairly decent portion of us struggle with it on some level.